Plans announced on Sunday will see troubled US mortgage giants Freddie Mac and Fannie Mae brought under tighter government control. Confidence in the two businesses, which are at the heart of the multi-trillion US housing market, has waned as property prices have collapsed and foreclosure levels have soared. The US Treasury said in July it would shore up their finances if they needed help in what would be the biggest state rescue in history. Now it is pledging trillions in financial guarantees for the two firms over the next 16 months. They are both shareholder-owned companies mandated by the US Congress to provide funding to the housing market. Fannie Mae is short for Federal National Mortgage Association, Freddie Mac short for Federal Home Loan Mortgage Corporation. Fannie Mae was founded in 1938 at a time when millions of families could not become homeowners, or faced losing their homes, because of a lack of mortgage funds. It was a government agency until 1968. 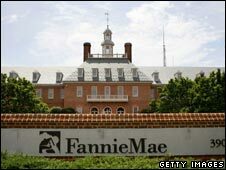 Freddie Mac was created in 1970 to provide competition to Fannie Mae. The two firms do not lend directly to homebuyers, instead buying mortgages from approved lenders and then selling them on to investors. They guarantee or own roughly half of all the $12 trillion US mortgage market and this figure has been steadily increasing as other lenders have either failed or reduced their exposure to a falling market. Almost all US mortgage lenders, from huge financial institutions like Citigroup to small, local banks, rely on Fannie Mae and Freddie Mac. Lenders look to Freddie Mac and Fannie Mae for the funds they need to meet consumer demand for home mortgages. By linking mortgage lenders with investors, the two firms keep the supply of money widely available and at a lower cost. There is no direct UK equivalent to the two firms. 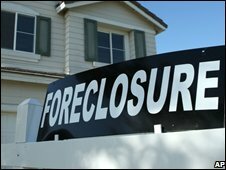 Fannie Mae and Freddie Mac have made billions in losses as the US housing market has seen a big increase in defaults and repossessions. The firms lost more than $3bn alone between April and June, resulting in a sharp fall in their share values. To cover these losses they have tried to raise funds but investors fear they may not be able to raise enough to cover their liabilities. They have to pay out if ordinary homeowners cannot pay back their home loans, which is proving a huge drain on their finances. How is the US government proposing to protect the firms? Plans approved by Congress this summer allow the government to support the two firms by expanding their access to credit and permitting the Treasury to buy shares in the companies if needed. More radical steps have now been drawn up to place the firms in a so-called "conservatorship". In this scenario, the government will guarantee the firms' debts, bring in new management and provide fresh liquidity to make the business less vulnerable to the declining market. This process will take at least a year and will be highly expensive. According to the Congressional Budget Office, such a move could potentially cost US taxpayers up to $25bn. Some commentators have criticised the prospect of such a giant "bailout" for companies that are privately owned. But the Treasury hopes that taking such action will help to rebuild confidence and stability in the mortgage markets. What would happen if they failed? This prospect is all but unthinkable as far as the nation's bankers, regulators and politicians are concerned. Should they collapse, mortgages would be harder to get hold of and much more expensive and an already enfeebled property market would be further undermined. President George W. Bush has pledged to do all he can to support the two firms in their current form. The two men hoping to replace him in the White House have also backed efforts to put the two firms on a sounder footing. Barack Obama, the Democratic Presidential nominee, said action must be taken to stabilize the two firms "because the housing market, which is already weakened, would be in even worse shape if we didn't take some steps". For the Republicans, Presidential nominee John McCain said the two firms needed to be reconstituted. "There's got to be reorganization and there's got to be some confidence that we have stopped this downward spiral," he said.